Since we’re approaching the 200 year anniversary of the first bicycle, we thought it would be a good time to get you all caught up with the last two centuries of two-wheeled history. Bicycles have been a big part of our society for a while now; almost everyone in the first world has learned to ride a bike at some point. We all remember our first lessons from when we were kids, and of course, our first awesome wipeout. These are our own personal biking milestones of course, but those two-wheeled devices (that are often both our favorite tool and worst torture device, depending on how well we can steer) have been around for 200 years, and they have quite a few milestones of their own. So in celebration of all those successful stunts, scraped knees and epic crashes, below are 58 of the greatest milestones in biking history. For all practical intents and purposes, this was the first thing to actually qualify as a bicycle. Invented by a German Baron named Karl von Drais in 1817. It was a success, which saw some popularity in both Germany and France. Later on this bike, which became known as the Draisine, shifted from its common use to versions that were designed specifically to be used on railroads (which meant 4 wheeled versions), however despite that, this bike was the beginning of cycling’s 200 year 2-wheeled reign. This terrifying-sounding thing is actually the first bicycle to have front-wheel pedals. It is also sometimes known as the first Velocipede. The name boneshaker comes from the fact that they were incredibly uncomfortable. This is because they were hard to control and shakey, with a stiff frame and wooden wheels with iron tires. Ouch. The Penny-Farthing, also known as the High Wheeler or the Ordinary, looks ridiculous by today’s standards, however when they were first released, they were all the rage. These bikes are easily recognized by their enormous front wheel and tiny back wheel. The Penny-Farthing is most likely the first bicycle to actually be referred to as such in its time period. That, combined with its relation to the birth of sports-cycling and its unique design make it an important cornerstone of cycling history. 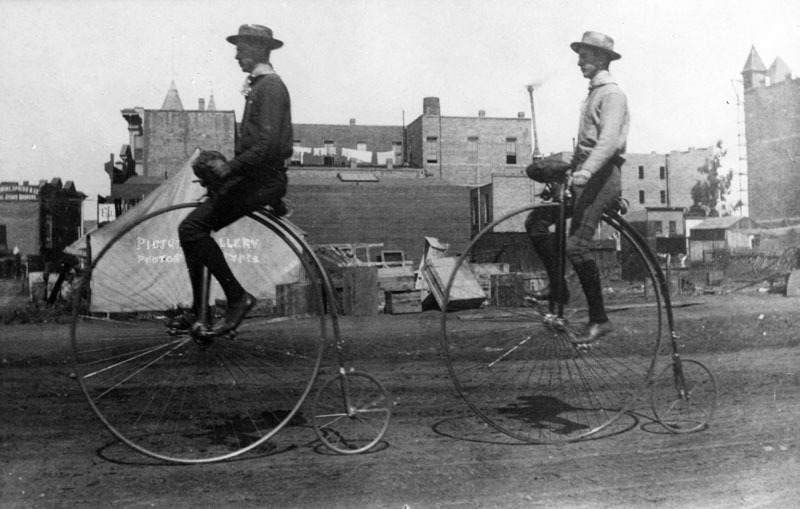 The Penny-Farthing was popular for decades following its inception. In 1872, it was first manufactured in Britain (where the cycling market moved to in the 1870’s), and In 1878 inventor William Henry James Grout created a portable version which could be easily assembled and disassembled as needed. It wasn’t until 1868 that bicycles started to be mass produced. Pierre Michaux, a big-name blacksmith and bicycle manufacture partnered with Aimé, René, and Marius Oliver, or the Oliver brothers, to begin the mass production of velocipedes. The Oliver brothers were wealthy businessmen, and combined with Michaux’s expertise, they made a fortune off of the bicycle crazy of the 1860’s with their company, Michaux et Cie (meaning Michaux and Company). The Roper Steam Velocipede was the first steam-powered bicycle, coming out around the same time that bicycles began exploding on the market. However, it doesn’t just belong in cycling history; the Roper Steam Velocipede is also regarded by some as the first motorcycle, though whether it constitutes a motorcycle is a matter of debate. The mind behind this bike is Sylvester Roper, a major name in the world of steam engines and vehicles. 1869 is when the first rubber tires were used for bicycles, which was a major game changer in the development and production as well as the capabilities of bikes. It’s also the year of the first official bicycle road race. The race route was from Paris to Rouen, a distance of 113 km, and it was won by cyclist James Moore. France pioneered sport cycling along with many other European countries, and even today they host some of the biggest cycling competitions in the world. One of the staples of the circus, the unicycle dates back to the 1870’s. Originally made as an offshoot of the Penny-Farthing, the unicycle has inspired crazy ideas since its inception. From riding one down a mountain, up a ramp or across a tightrope, it seems there’s no end to the life-endangering stunts you can get up to with a one-wheeled bike. Before the bike chain became a thing, pedaling and controlling a bicycle could be a real pain. Essentially without the chain you could only pedal the front wheel, leaving the back wheel to roll from your momentum. As you can imagine, it made things like starting, stopping, and even turning a challenge. The bike chain, patented by Henry J. Lawsen, fixed all of that. Though the design has had some evolutions, we still use bike chains to this day. 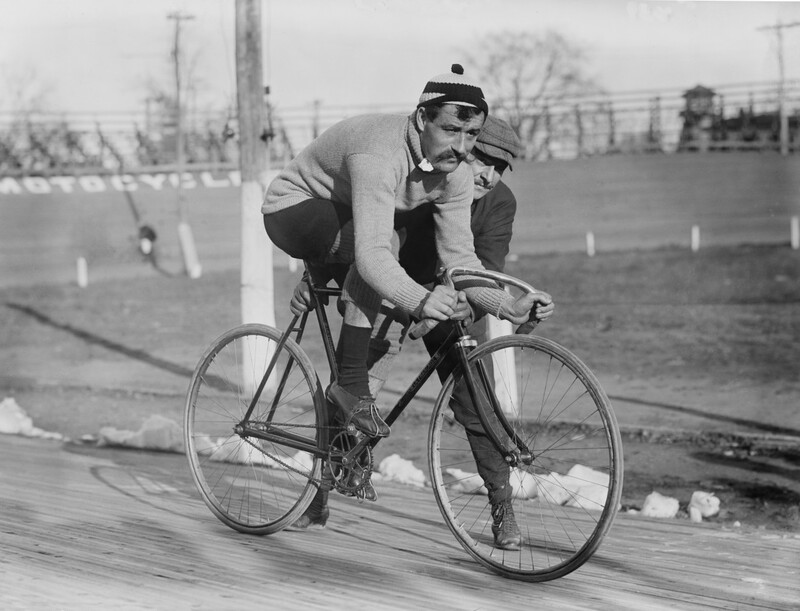 The league of American Wheelmen is one of the most well-known cycling associations in history. Founded in Rhode Island, USA by Kirk Monroe and Charles Pratt, it was huge, with its membership soaring all the way to over 103,000 people in 1898. The league advocated for improving road conditions. They even went so far as to found the Good Roads Movement, which is responsible for Good Roads Magazine. All good things must come to an end however, and in 1900, the League’s membership plummeted by 25,000, and by the time they dissolved in 1902, they had only around 8500 people still remaining. The league returned in 1939, but had poor membership right from the start, and never made it over 1000 people before they dissolved again in 1955. Finally in 1965, they were revived once again, where it saw moderate success. They changed the name to League of American Bicyclists in 1994, and are still around to this day, with around 20,000 paid members and approximately 300,000 affiliated with them in other ways. The safety bicycle was the first to resemble he bicycles we ride today; two wheels of equal size with a similar frame. The Rover Safety, designed by John Kemp Starley, was the official alternative to the Penny-Farthing. Marketed as a safer bicycle for regular people, it was a big hit amongst the cycling community, and was a big factor in creating many women cyclists. Since the safety bike was lower to the ground and its wheels were the same size, braking was safer, and crashing in generally was not nearly as dangerous. This is another one that shares a spot on the motorcycle list, in the 1890’s Gottlieb Daimler put an engine on a bike, turning it into one of the world’s first real motorcycles. Gottlieb, one of the pioneers of the internal combustion engine, was happy to show off his motorcycle, the Reitwagen, to the world. In this year, the British army also began using cyclists for scouting missions. In 1887 American immigrant Thomas Stevens became the first person to travel around the world on a bicycle. His bike of choice? The Penny-Farthing. His journey began in San Francisco on April 22, 1884; a place he finally returned to in January of 1887. Later on in the same year, the Raleigh Cycling company was founded. Raleigh Cycling is known for a few of the other entries on this list; they’ve made their mark on bicycle history. The inflatable or pneumatic tires of bicycles have humble origins. John Boyd Dunlop, who had extensive knowledge regarding working with rubber, originally developed inflatable tyres for his son’s tricycle. Through testing, he discovered that his new style of tyre was superior, and began working towards getting it patented. Cyclist Willie Hume proved that Dunlop’s pneumatic tyres were superior in every cycling event at the Queen’s College Sports in Belfast. Hume went on to win almost every cycling event at a similar event in Liverpool, undeniably proving the value of Dunlop’s invention. The back-pedal brake, designed to brake the bicycle by simply pedalling in the opposite direction, had been around for a while, first appearing in the Penny-Farthing, and then returning in the Safety Bicycle. However, it wasn’t until 1889 that the design was patented by Daniel Stover and William Hance. As bicycles became more and more common, the idea to use aluminum rose. Alumnium is a light metal, making it very useful for building bicycles. In the 1890’s, Cycles Aluminum started the mass production of Aluminum bikes, allowing the design to spread. The Tandem Velocipede patented in 1891 is the world’s first two-seater bike. Tandem bicycles quickly caught on as a cute gimmick for couples, and stayed popular until WWII, where they nearly disappeared from the market entirely. In the 60’s and 70’s, the Tandem bicycles started making a comeback in the UK and they even appeared in some cycling sporting events. These days, it’s rare but not impossible to find one in public. This was also the year of the first international, Six-day bicycle race. It was held in New York’s Madison Square Garden, with cyclists from all over the world competing. The two-man team style that is now standard in Six-day cycling events is called a Madison event since it was developed at this very race. The folding bicycle was originally patented by Michael B. Ryan. It was designed to make bikes more portable. They did ok on the market, but the real interest in the idea came from the army; various military powers had begun using bicycles for scouting missions, so the need for a more portable and easy to carry bicycle was great. Fun fact: in this same year, the famous Wright Brothers, as in the fathers of aviation, started a cycling company based in Ohio. On board a trusty men’s Sterling bicycle, Annie Cohen Kopchovsky, aka Annie Londonderry, started her journey in Boston, after accepting a wager to complete her trip in under 15 months. The wager was to see if a woman had the ability to take care of herself and complete just a journey; and Annie Londonderry proved that with ease. She became known in history as a powerful symbol for feminism, proudly declaring she could do anything a man could do; a revolutionary idea at the time. Ogden Bolton Jr.’s patented battery powered bicycle gained a lot of attention when it came out. Basically a small-framed electric motorcycle (or more properly classified as an electronic bike or e-bike), this thing had 100 amps of power pumping out of its 10 volt battery keeping it running. 1896 was a huge year in bicycling history; it marked the first time that competitive cycling appeared in the Olympic games. There were several events; track cycling, which was held in the former Neo Phaliron Velodrome in Athens. There was a 10,000 metre race, a 100 kilometer race, a road race and a 12 hour race that only had two competitors. Greece took the gold in the road race, France took it in the Sprint, Time trial, 10 km and 100 km races, and Austria won the 12 hour race. This one isn’t a bike, but it changed the design of almost every bicycle made after its invention. The idea is simple; this change allowed for bicycles to continue moving without being pedaled. In other words, before this invention, bicycles had to be pedalled constantly, making it nearly impossible to coast. Once upon a time, a man named Charles Minthorn Murphy declared that “there was not a locomotive built which could get away from (him).” And he set out to prove himself right. Well, he might not have been entirely correct, but Mile-A-Minute Murphy was in fact, the first person to complete a mile in under 60 seconds on a bicycle. He did this by closely following a moving train in order to take advantage of the slipstream effect. Though his efforts resulted in him getting serious burns and having a spectacular wipeout at the end of the minute, he successfully travelled a mile in 57.8 seconds, AND he surpassed the travelling speed of the train he was following behind (which is also why he crashed directly into it and nearly died). The first recumbent bikes were made in 1901. These things look like a recliner on two wheels. Unlike a traditional bike where the rider sits upright or leans forward slightly, a recumbent rider leans back in a more relaxed position. Recumbent bikes have a large seat and a backrest, and are designed to be very comfortable. You might think these bikes are simply impractical or slow luxury bikes made for taking it easy, but you’d be wrong. Actually, these bikes are aerodynamic and capable of great speeds. In fact, a recumbent bicycle currently holds the world speed record for bikes. The world’s most well-known cycling event is the Tour De France. Held annually, it is the most prestigious cycling race in biking history, consisting of multiple stages and taking place across 23 days, usually in July. The first Tour De France, held in 1903, attracted nearly 80 entrants, and was won by Maurice Garin. The race consisted of 6 stages across a length of around 2428 km, and took place over 19 days. This was also the year that internal hub gears were invented, to keep the gears safe from the elements and properly lubricated. Paul de Vivie was the first to come up with a rear derailleur gear for bicycles. This two speed gear was another big game-changer for bicycles. At the time most bicycles were only a single gear. Vivie’s invention was met with much resistance in the cycling community for years until professional rider Edouard Fischer, on his gearless bike, went up against the less experienced Martha Hesse using a three-speed version of Vivie’s derailleur. Hesse’s victory proved the derailleur’s supremacy. The credit given to Vivie has been the subject of some controversy; some believe Vivie simply improved upon an invention that already existed. Whether he really is the father of the gear system or not however, his invention and the work he put into marketing it allowed the gear system to spread at an incredible pace. With the industry looking a little grim, cycling companies around the world began looking for a new angle to get into the market. That was when they had the brilliant idea to start making bicycles for kids to ride. It seems natural to us now for kids to hop on their bikes and ride around; after all most of us did exactly that when we were children. 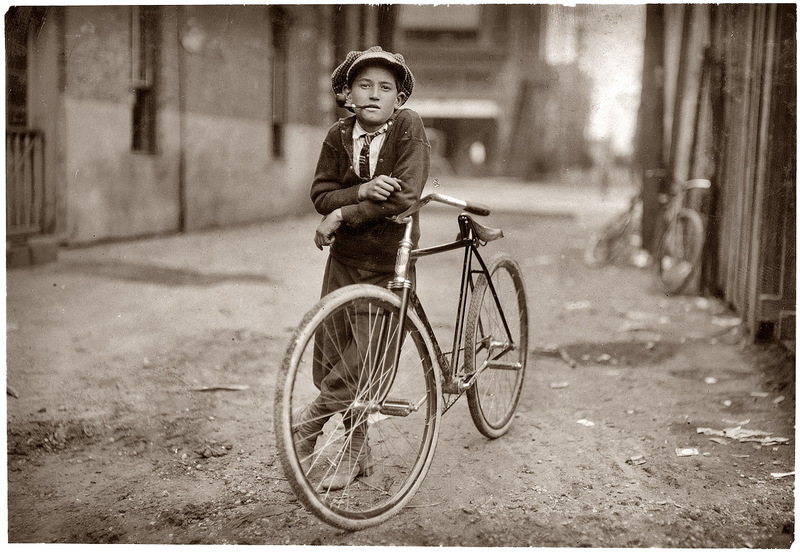 But before the 1920’s, biking was a strictly adult activity. However these days, almost every kid in the west is on a bike during the summers. Today, Shimano controls 50% of the world’s bicycle component market, selling everything from brake parts to pedal components. The company was originally founded by Shozaburo Shimano, who became fascinated with bicycles from a young age. The company quickly spread from Japan to the global market under Shozoburo’s leadership. The company is run today by his descendants; following his death in 1958, his sons took over, and continued Shimano Inc’s steady climb in the world’s market. Some velocars were simply a recumbent bike with a full frame/shell around it. Most velocars have 3 or 4 wheels. These days, velocars are fairly rare, but they were well known in Mochet’s day. To put it simply, this invention was designed to allow for the wheels of a bicycle to be easily removed and re-installed. The quick release was created by Tullio Campagnolo, an Italian cyclist who made it to allow for quicker gear-switches. This was because to switch gears without a derailleur, you would have to remove the wheel and change gears by hand. The quick release made the process much faster for cyclists, changing the game for cycling races. Also known as the beach cruiser, these bikes weren’t made for sport or speed. They weren’t made for doing jumps or cool tricks. They were made for one thing and one thing only; going on a leisurely bike ride. Cruisers have an upright seat for good posture, stylish frames and they (usually) only have a single-speed drivetrain. These bikes are made heavy and have balloon tires, making them slow, but durable. When these bikes came out, they were extremely popular, especially among casual cyclists. They dominated the market until the 1950’s, and made a comeback in the 90’s. To this day, many people prefer a stable cruiser bike when they’re going for a casual ride. Recumbent bicycles, as mentioned before, were surprisingly fast. So fast, in fact, that in 1934 the Union Cycliste Internationale (UCI) banned them from being used in cycling races under their name. Recumbent bicycles now race under the Human Powered Vehicle Association (HPVA). It’s not exaggerating to say that allowing derailleur gears in the races, which enabled riders to change gears without removing the wheel, revolutionized professional cycling races forever. Sometime in the 1950’s, cycling companies looked at their various lines of bicycles and thought to themselves, “you know what this needs? A radio!” And thus the radio bikes were born. A true sign of the times, the Radio Bicycle was a popular gimmick. It’s not hard to see why; being able to listen to your favourite radio station while going for a nice leisurely ride can only improve the experience, right? 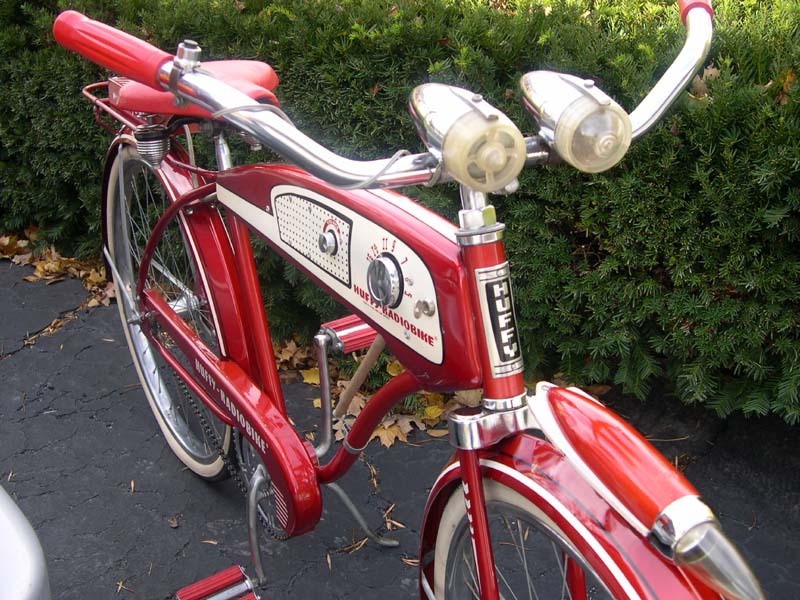 Unfortunately, with the influx of European bicycle models in the 60’s, the popularity of the radio bike was overshadowed, and the radio bike ended up lost in obscurity. BMX was created as a mimicking of motocross, originating when children began using bicycles to try and copy motocross stunts. The idea is that racers perform a series of stunts, tricks and jumps either during a race or freestyle. Though the first official BMX race was held in 1956, the sport didn’t catch on until the 70’s. A Moulton bike stands out. The bikes produced by this company are known for their unique design, small wheels and their suspension, which was known for being ahead of its time. Founded by Alex Moulton, who found himself unhappy with the currently popular designs for bicycles, he founded his company to provide a new style; small wheels with high-pressure tyres for better acceleration, good suspension made for comfort, and a new style of frame, which is now known as the F-frame. The Moulton Bicycle Company’s design became a symbol of the 60’s, and inspired many other companies to respond with their own small-wheeled bikes. The Raleigh Bicycle Company is one of the oldest cycling companies in the world, their founding dating back to 1885. In 1968, they created the coolest looking children’s bike to date: the Raleigh Chopper. This thing was like baby’s first motorcycle in design; a recumbent-style seat, a chopper motorcycle style handlebar, and a stylish frame. This was the must-have kids bike of the early 70’s. The success of the Raleigh Chopper more or less saved the company from financial ruin, as it dominated sales. Though it was criticized as being very unsafe (the bike itself was unstable and prone to crashing), it is remembered as one of the staples of 70’s culture. With cycling for sport becoming more and more popular, it was obvious that mountain biking would become a thing sooner or later. In 1970, Charlie Kelly and Gary Fisher came up with a bike built for hard-core terrain. It had heavy-duty wheels and a suspension system, allowing it to climb steep inclines, ride over logs, rocks, dirt roads and anything else you’ll find on a mountain. To this day, mountain biking is popular as sport. It’s a fairly extreme sport, as mountain bikers are prone to crashing or wiping out in spectacularly painful ways, particularly for those who ride on more rugged terrain. Titanium is probably the most expensive metal used for mass-produced bicycle frames. In 1974, cycling companies started to use titanium for their bikes because it possesses many key traits. For starters, titanium is a very strong and resilient metal, capable of withstanding a lot of abrasion. It’s also got an excellent weight for a metal of its strength. However, titanium is expensive and difficult to work with, which makes the cost of production high. As a result, titanium bikes are notoriously expensive. Some would argue though that it’s simply the cost of quality. In this same year, Chester Kyle and David Gordon Wilson began the modern recumbent movement. In 1974 the loving couple Veronica and Colin Scargill from England decided to travel around the world together; on a two-seater bike. Their journey took them 18,020 miles around the globe, finally completing their journey on August 27th, 1975. They were the first couple to ride around the world on a tandem bicycle. The world’s first international Human Powered Speed Championships were also held in this year. The world’s first major organized mountain biking race took place in 1976. It was a downhill time trial race, hosted in Fairfax California on a road now known as Repack Road. The event was organized by Charlie Kelly and Gary Fisher. In 1979 Freddie Markham, also known as Fast Freddie, set the world speed record of 81.8 Kilometres Per Hour, riding a Human Powered Vehicle. Fast Freddie later went on to beat the record two more times, in 1989 and in 2006. With the increase in mountain biking’s popularity, it became clear that more and more people were interested in trying it out. To that end, Specialized Bicycle Components released the Specialized Stumpjumper; the first mass produced mountain bike. The 15 speed bike was popular, its first shipment selling out in under a week. The International BMX Federation was founded in this same year by Garrit Does, a professional motocross racer and a major pioneer in the European BMX community. The popularity of BMX racing spiked during the 70’s, especially in the US. And of course, in 1981 the IBMXF was founded. It was only a matter of time before a world championship took place. The first world championships were hosted by the IMBXF in 1982, and won by Greg Hill. Though the IBMXF exists, the UCI are actually the authority on BMX racing and its official rules, and as of 1996 they have hosted the annual BMX World Championships. These neat devices, sometimes called cyclocomputers, are small digital displays attached to your bicycle that displays information like speed, distance travelled and the current time. The devices first appeared in 1983, and today they continue to be a popular cycling accessory. This was also the first year for the European Human-Powered Championships for Human Powered Vehicles. The first World Unicycling Convention and Championships (UNICON) made its debut in 1984, in Syracuse, New York. There are multiple events at the UNICON, ranging from track races of varying distances, time trials, unicycling cross-over sports like basketball and hockey, cross-country, and artistic stunts/displays. UNICON is held almost every 2 years, usually in the summer. The most recent one was in Montreal Canada, and the next UNICON is scheduled to appear in San Sebastian, Spain. From their inception, mountain bikes were designed for a more heavy duty style of cycling. However in 1987, Paul Turner, founder of the now defunct cycling company RockShox, made a big improvement on the existing models with his full-suspension mountain bike. Bike suspensions were Turner’s thing, and his full-suspension mountain bike was just one of his cycling babies. Though the industry was less than impressed when he first unveiled his work, the full-suspension bike quickly became known for its capabilities. The Mountain Biking Hall of Fame, originally located in Crested Butte, Colorado and now located in Fairfax California, chronicles the history of the sport and it’s most prestigious stars. Like the hall of fame for any other sport, a big part of the MBHOF is recognizing the biggest stars in the community for their achievements and contributions. Those inducted are people who have either achieved legendary status in the sport, beaten a world record, earned a spot in mountain biking history, or revolutionized the community in some way. The 1988 inductees were Joe Breeze, Steve Cook, Charlie Cunningham, Gary Fisher, Charlie Kelly, Murdoch, Joe Murray, Jacquie Phelan, Tom Ritchey and Mike Sinyard. In 1989, to curb serious injuries and deaths associated with bicycle accidents, the Australian government passed the world’s first helmet laws, ordering all cyclists to wear a helmet. Many other countries followed suit, reducing death and serious head injuries by a significant number. Only problem is that ordering cyclists to wear a helmet decreases the number of people cycling, so it might not be in our best interest to make helmets mandatory. Shimano Total Integration, also popularly known as a shifter, combines the gearshift controls and the braking controls. This device, developed by Shimano Inc, allows cyclists to shift gears without taking their hands off the handlebars, making it more accessible. The device was originally intended for racing bikes, but now many types of bicycles have a similar system in place. The artist Eric Staller created the Conference Bike, which seats 7 people, as an art project in 1991. This bike has 7 people sitting in a circle, all pedalling, while one of them steers. A novelty device, the Conference Bike is often used in tourism and team building exercises. In fact, Google has 9 of them at their headquarters for employees to use in various activities. It’s made a name for itself as the silly gimmick bike, and it has a lot in common with the party bike. Another improvement on the gear-shifting mechanisms, the electric derailleur works by having a small battery on the bike attached to a motor that controls the derailleur, and is triggered via a wired or wireless control switch. Though the gear-shifts are faster, it is not entirely agreed upon in the cycling world if electronic ones are in fact objectively better. The advantages are clear; faster gear-shifting, less over-all maintenance required, easier controls and a reduced shock on drivetrain components. However, there is no way to manually override the system when something like dead batteries come into play. Also, the electronic systems are expensive and many variations have been recalled because they are unreliable. Disc brakes are primarily intended for off-road bikes, however they have made appearances on other models. A disc brake is a metal disc that is attached to the wheel. When the brakes are trigger, the disc slows down, thus forcing the wheel to also slow. Disc brakes are known for having a high resilience to the elements and conditions, and they are highly compatible with both front and rear suspension systems, which is why they are the go-to choice for mountain bikes. The Atlanta 1996 Summer Olympics were the first to host a mountain biking event. Both the women’s cross country and the men’s were a huge success. In the women’s, Italy’s Paula Pezzo took the gold, Canada’s Alison Sydor went home with silver, and the USA’s Susan DeMattei claimed bronze. In the men’s, the gold went to the Netherlands’ Bart Brentjens, Switzerland’s’ Thomas Frischknecht won the silver and France’s Miguel Martinez took the bronze. Prior to 1999, Lance Armstrong was making his name known, winning stages in the Tour De France. But it wasn’t until 1999 that finally proved himself as one of the greatest cyclists in the world and won the Tour De France. Lance Armstrong was the Cristiano Ronaldo of the cycling world. However, he has recently had a major fall from grace after it was revealed that he was doping to get an edge on his competition. BMX made its first Olympic appearance at the 2008 Beijing Summer games, at the Laoshan BMX field. There were two races, one for women’s and one for men’s. France’s Anne-Caroline Chausson and Laëtitia Le Corguillé won gold and silver with Jill Kintner of the USA winning bronze in the women’s race. In the men’s, Māris Štrombergs of Latvia claimed gold, with Mike Day and Donny Robinson from the USA earning silver and bronze. Near Chengdu, China, a cyclist’s heaven of a city is being built for a population of approximately 80,000. Dubbed “The Great City”, it’s a car-free area. The idea behind car-free cities is to reduce pollution emitted by cars; car pollution is one of the biggest causes of pollution in the world, and China especially has been known for its severe smog problems. Cars are not entirely banned in The Great City, there will be space for them, and electric-powered public transit will be allowed. However, the idea is for cars to be completely unnecessary. In 2013, Dutch cyclist Jonkheer Sebastiaan Bowier broke the previous world speed record for unassisted cycling in a Human Powered Vehicle, clocking in at 133.78 kilometers per hour. Using a recumbent bicycle he beat the record in Battle Mountain, Nevada, on a 200 meter stretch.